The Pleasures of Reading | Maxine Platzer Lynn Women’s Center, U.Va. 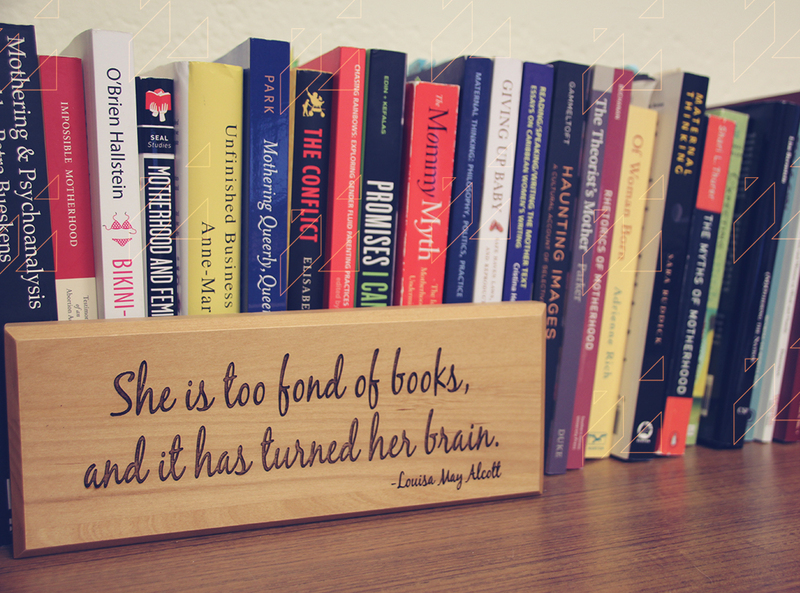 A couple of birthdays ago, my husband and daughter gave me a plaque for my office with a quote from Louisa May Alcott: “She is too fond of books and it has turned her brain.” How well they know me! Periodic escape into the world of fiction is one of the activities that keeps me me. For as long as I can remember, reading has been a form of self-care for me. When you live on the academic calendar, as I have my whole life, summer becomes a time to indulge in a love of reading. And when you’re a booklover, people often ask for recommendations. Where to start? is usually my problem. As I gathered books for our family vacation (our idea of the ideal vacation is one where we can – and do! – bring more books than shoes) and pondered this post, I thought of a recent generous gift to the Women’s Center. Last fall, the Women’s Center was the fortunate recipient of Mr. Edwin Barber’s gift of books from his late wife’s library. Virginia Price Barber passed away in February 2016, and Mr. Barber wanted to honor his wife’s work and ensure that future generations of women and men would be able to enjoy her legacy in the physical books she left behind. Ginger Barber’s career exemplifies the pioneering leadership of extraordinarily accomplished women that the Women’s Center champions. Valedictorian of her high school class, Phi Beta Kappa graduate of Randolph-Macon Women’s College, she earned a PhD in American Literature from Duke University. In 1966, Ginger and her husband moved to the Chelsea neighborhood in New York City; in their decades there, they raised their family and Ginger nurtured the Virginia Barber Literary Agency, where she built an impressive list of fiction writers with whom she worked, including the Nobel laureate Alice Munro. Ginger was a champion of women’s writing, admiring ways that writers like Munro make explicit the “social structures that girls and women were expected to abide by”. Ginger shared her love of literature and her talents in other important capacities as well, including serving as a founding member of New York’s Women’s Media Group, as the president of the Association of Authors' Representatives, on the board of New York’s Literacy Partners, the Library Advisory Board of Duke University, and the Board of Poets and Writers. After selling her agency to the William Morris Agency in 2001 and retiring a few years later, Ginger lived the rest of her life here in Charlottesville. Given her personal and professional interests, a gift of volumes from her library to us is a poignant memorial to Ginger. While we sadly cannot invite you to borrow Mrs. Barber’s books this summer (we had to put our entire library into storage for the time that we are out of the Corner Building for renovations), we look forward to welcoming you into our renovated space in 2018, when you will be able to check out these additions to our library. In the meantime, I have the following recommendations, from among her clients’ books, of old favorites and new releases. Reopening a book's cover reopens a door to the past. One of the pleasures of rereading a novel is the way it lets you relive an earlier moment when you first (or last) read it. Dipping back into Colony, my body might be at Shelburne Farm on Lake Champlain, but my memory is a newlywed spending weekends on the Jersey Shore. While I laugh at Natalie’s antics in the here and now, I also smile at the joy of finding the first grown-up author my sister and I both loved. A "what's he dunit" rather than a whodunit, The Pilot's Wife chronicles Kathryn's discovery of her husband Jack's secrets after the transatlantic flight he was piloting crashes off the western coast of Ireland, killing everyone on board. Shreve builds the mystery deliberately. Even more notable is the way in which she captures the fog of trauma that Kathryn is pushing through. Beautiful jewels of sentences puncture this fog with quiet observations like, “She didn't think Jack had ever felt the coming and the going in quite the same way she had. To leave, after all, was not the same as being left.” Throughout the novel, Kathryn questions the tenor of her marriage, at one point concluding that, “they, like all the other couples Kathryn has ever known, live in a state of gentle decline, of being infinitesimally, but not agonizingly, less than they were the day before.” The map for this journey only becomes clear at the end of the novel. From the suspenseful drama of The Pilot's Wife, we move to a quieter drama with Anne Rivers Siddons’ family saga, Colony. Generations of Chamblisses have summered at Maine's Retreat Colony on the coast. Siddons traces the ways that family claims us as one of its own, exploring questions of what we owe our children and ourselves – and how we navigate the conflict that arises when these needs are in opposition. Colony offers the portrait of another marriage, one of decades of devotion honed in an environment in which “so many of the older women of Retreat […] appeared to gain enormous strength, almost power, at the death of [their] husband.” Near the end of her life, Maude Gascoigne Chambliss shares what she “did for love” with her granddaughter Darcy and her lucky eavesdropping readers. So intimate are her observations that reading Colony, one feels like the child hiding under the tablecloth to listen to adult conversations, hoping not to be discovered for fear of missing the ending. Where The Pilot’s Wife is quietly dramatic and Colony is richly poignant, The Inn at Lake Devine is wickedly funny. Twelve-year-old Natalie Marx is horrified when the owner of The Inn at Lake Devine sends a carefully worded refusal to her mother’s inquiries about the availability of rooms. Lipman tackles anti-Semitism and interfaith marriages with humor and perspicacity, and through characters who are fully human in their strengths and foibles. When Natalie first meets Mrs. Berry, she begins the confrontation of stereotype and reality that will unfold over the course of the novel: “I stared at the woman I had made it my business to harass by telephone and mail, a federal offense for sure. She looked perfectly nice, I thought, with her high color and her Canada mint-pink lipstick.” The scents of foods from the Inn, the Halseeyon, and Natalie’s kitchens waft through the narrative, with mushrooms offering several unexpected points of connection and plot twists – and calling to mind the old adage that revenge is a dish best served cold. *To be read – blurbs based on Goodreads and Amazon reviews. Based on the true story of the largest fire in Maine’s history, Shreve’s new novel is set in a mid-century coastal town. Grace Holland, five-months pregnant and already the mother of two young children, finds both devastation and freedom in her efforts to cope with the loss of her home and town when it all burns to the ground. Grace’s journey is marked Shreve’s trademark interest in how we claim bravery in the face of uncertainty. Siddons’ newest novel takes us to summer camps, Camp Sherwood Forest and Camp Edgewood, in the North Carolina mountains. In these settings, Siddons weaves together her trifecta of mother-daughter relationships, marriages, and secrets, as her protagonist Thayer Wentworth confronts truths that she would rather not acknowledge. Faith Frankel finds herself frankly a little confused: at 32, she hasn’t quite launched herself. She has purchased a home of her own, but in her hometown; she has a job, but writing thank-you notes for her alma mater. No one in her life behaves quite as they should. Some mysterious artifacts in her attic raise existential questions. As she so wittily and insightfully does in her other novels, Lipman again finds the humor in emerging adulthood, in the introspection and the parent-child negotiations that the process demands. I’ll close with words I often offer my students: Happy reading!